Why was this group set up? Research asking coaches what they needed the most gave a resounding answer of ‘Help with developing our practice’. Results from 500 responses* showed that coaches love the profession, delivering coaching and making a difference to their clients, but often they struggle with how to run it as a business. This group will be meeting approximately 4-5 times a year. There will be evening meetings as well as one-day masterclasses at special rates. What Do You Say to Attract Clients to Your Coaching Business? One of the key marketing challenges many coaches face is knowing how to position themselves and what to say to get people interested in coaching. How do you get potential clients interested in your work and wanting to learn more about it? Lisa Farr has taught hundreds of coaches how to achieve this and in the session she will take you through the same process she takes her one-to-one clients through. You will have the opportunity to create your own authentic messages which will help you to attract clients without sounding like a salesperson. There will be a presentation on a key subject to give you insights and useful information that you can apply in your business. There will also be networking and sharing in pairs and groups. You can pay below via Paypal, it is £30 to attend. Only 30 spaces available due to room size. It is advisable to book early to secure your space as some of the meetings have been fully booked. 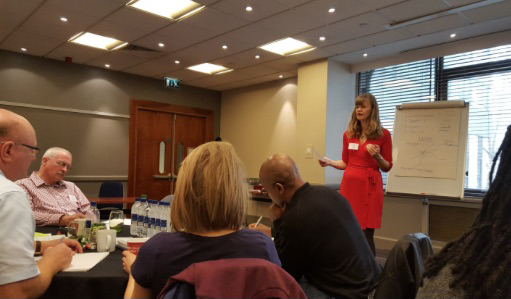 Lisa Farr specialises in helping coaches to get more clients and make more money with ease and integrity. She has over twenty-five years experience in marketing and is a Fellow of the Chartered Institute of Marketing, which puts her in the top 3% of marketers worldwide. Come along and join Lisa Farr and others for inspiration, connection and insights. You can pay below via Paypal, send a cheque or make a bank transfer. It is £30 to attend. Book early as numbers are strictly limited. Please send me a message via the Contact Form below and I will send you the details. * Source of research: Association for Coaching survey 2014.